This course is perfect for boating enthusiasts and maritime professionals alike. Upon successful completion of the course, you will receive an internationally recognised Short Range Certificate as issued by SAMSA. In accordance with the Merchant Shipping (National Small Vessel Safety) Regulations 2007, as amended and Marine Notice 4 of 2016 (MN 4 of 2016), all vessels travelling further than 1Nm from the coastline must have, at a minimum, a VHF radio with DSC on-board. Our facilitators will train you to be able to get the most out of your radio, which could potentially save your life! How often are these courses presented? These courses are presented upon request for a minimum of three candidates. What is the duration of this course presentation? The course is presented over a 2 day period (the examination is conducted on the second day). Prior to the course commencement and once full payment has been received, you will receive your manual as well as a workbook. It is in your best interest to complete the workbook and bring it to the first classroom session. What is the course content? Our qualified instructors will facilitate your training to ensure you gain as much knowledge and experience as possible to be able to apply what is learnt in the course to your particular vessel and circumstances. What happens if I do not pass these examinations? • If you do not pass either the theoretical or practical assessments, then you will be allowed one rewrite with that examiner at a time that suits the examiner’s schedule. • Should you still be found not yet competent on the rewrite then you will be required to repeat the course at an additional cost. What are the costs associated with this course? Please contact us for information and costs associated. Please note: Currently these courses are presented in Port Alfred only. 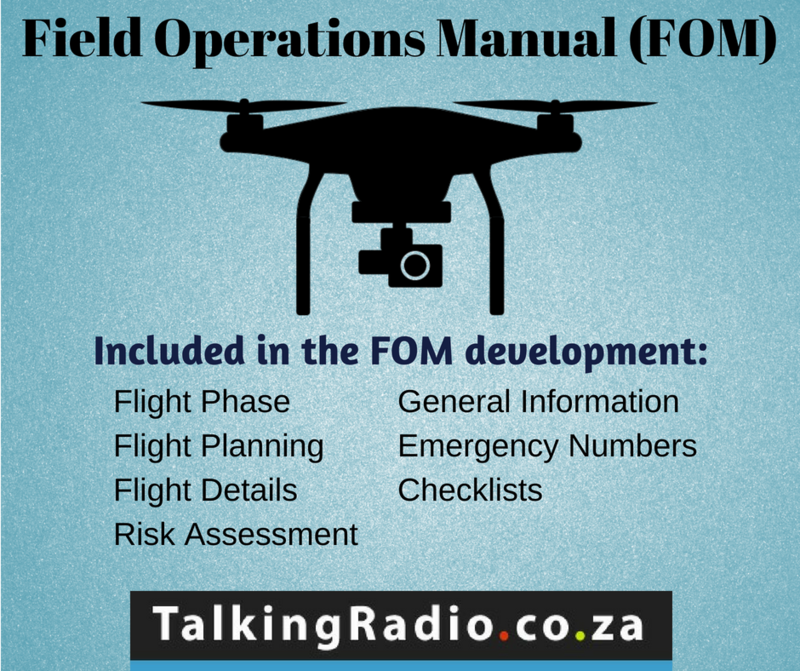 Field Operations Manual (FOM) now available for RPL Holders, RPAS Hobbyists and ROC Commercial Operators.